Taste of Baltimore: A Popchips Present! hey nakiya..wishing you a very happy new year !! 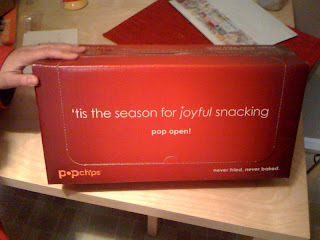 I really like popchips! What a great treat! SE - Happy New Year to you too! Beth and Simply Life - I know! What a nice surprise! I can't believe they just sent you a package off your letter to them. I need to write some people some letters! Dear Pillsbury, Your chop and bake goodness has wooed me to sugar frenzy so many times...please send Doughboy. 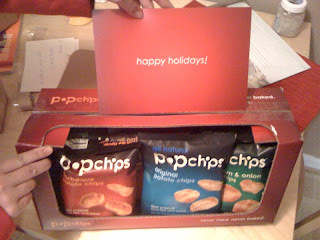 Seriously I am going downstairs and buying some Popchips right now because you made me remember how good they are. Starla - ahahahah trust me, it doesn't happen a lot! But seriously, Pillsbury, I really love cookies!